Easy to use self-propelled petrol lawnmower with a 50L collection bag. Built with a 2-in-1 cutting system: rear discharge or collect. Easily adjust cutting height with a lever from a choice of 7 heights between 25mm - 60mm. Has soft grip folding handles for comfort and compact storage. With the new R41SP 16 inch (41cm) petrol mower, Webb bring their high quality craftsmanship to those who prefer the flexibility of a rotary mower. This Webb self-propelled mower is powered by a Sanli 118cc OHV engine and a single lever adjusts the height to five different heights ranging from 25mm to 60mm. It has a 50 litre grass collector and comfortable SoftGrip handles that can be easily folded for compact storage. Webb mowers are made with only the very best materials. This mower comes with a strong and robust steel deck and ball bearing wheels as standard. 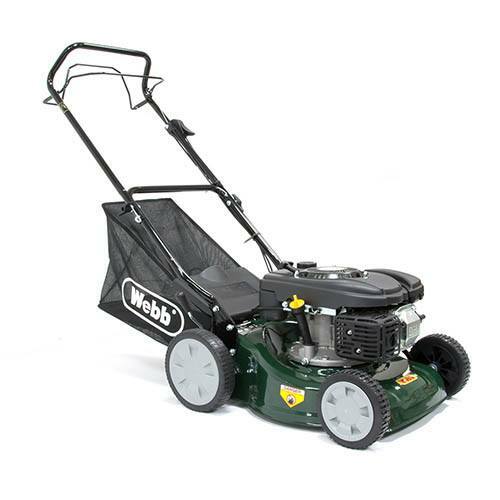 Webb mowers are built for durability and, to back this up, offer a 2 year deck, drive and engine warranty for domestic use, as they are confident that their mowers will give you many years of service. Supplied with 50L collection bag, folding handles and ball bearings for all wheels.